Yesterday was one of a few days I shed my tears in recent years, because a tortoise has died. I did not shed a single tear when my grandfather died. Indeed, this 100-year-old giant tortoise means much more to me. 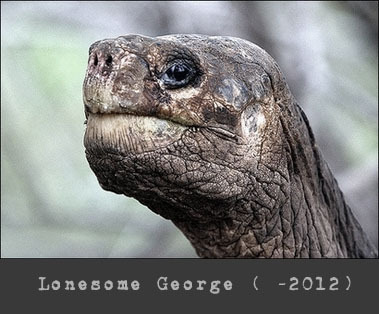 His name is George, Lonesome George. He’s the first tortoise I’ve ever heard of when I was a kid and the first specific animal I would make a special trip to visit. He was the last survivor of the Galapagos giant tortoise, the world’s largest tortoise, subspecies being lonely for over 40 years. His death means an extinction of the Pinta Island giant tortoise. I will always remember your special smell when you sneezed in front of my face. An extinction was not unexpected but I thought that day would come after I die.. Rest in peace, George. The Galapagos giant tortoise is not only the largest tortoise on earth, and the symbol of the Galapagos, it also helped Charles Darwin much with the Theory of Evolution. What makes the tortoise go extinct? Galapagos is one of my favorite places. When you go to a rainforest or desert and encounter an animal, it would normally have fled away before you can reach it. But animals in Galapagos are surprisingly laid-back. Mostly it looks like they do not care when people come close and even touch them. It looks like they are lack of a sense of self protection, or actually they don’t need it because it is a peaceful land. It was, before people entered the islands. The island was home to thousands of tortoises before people arrived. Sailors took the tortoises as a valuable source of meat. What made it worse is they used to collect mainly females which are smaller and easier to carry on the ships. It heavily reduced the number of tortoises on the island. The sailors had to look for another option of meat, so they introduced goats. The population of goats kept going up and soon it had dominated the island and eaten up most of the vegetation that the tortoises used to rely on and destroyed tortoise eggs. In 1906, research reported that there were only 3 male tortoises left. Afterwards 2 of them died, and George remained the last survivor for over 40 years. It is always heartbreaking to see an animal die, especially some long living ones like tortoises. They can live to 200 years, but at the same time their life is very fragile. They take over 20 years to become mature enough to mate so every egg counts. Galapagos is already one of the most peaceful paradise for the animals. You cannot imagine how dark is the future of tortoises of the rest of world. I can understand why people would have to take tortoises as a food source back in the 1900’s. But now in 2012 how could there be some people still eating turtles?